Number One for fiendish fun! 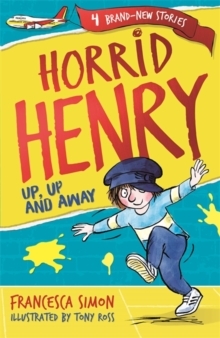 Horrid Henry takes to the skies in UP, UP AND AWAY!Horrid Henry is back and cheekier than ever in this brand-new book from the internationally bestselling author Francesca Simon. Contains four brand-new stories, featuring Horrid Henry wreaking havoc on an airplane, being forced to write an essay about the Tudors, sabotaging the school play and sneaking on to a forbidden rollercoaster. Illustrated by Tony Ross, these timeless stories offer an irresistible introduction to reading for pleasure, featuring one of the best-loved characters in children's fiction.